Arsenal boss Unai Emery will reportedly look to pursue three new players when the transfer window reopens at the end of the ongoing campaign. Emery was restricted from signing players on permanent deals in January, but the Spaniard did manage to recruit Denis Suarez from Barcelona with the option to buy. According to The Mail, the Gunners boss has set his sights on making three additions in the summer and this includes the requirement for another left-sided defender. 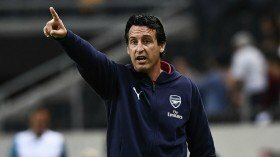 However, Emery is likely to have limited funds to spend with various reports indicating that the board have allocated a £40m kitty before player sales. Emery is currently considering the positions of Mesut Ozil and Shkodran Mustafi and the former, in particular, seems likely to make way from the Emirates when the season concludes. Ozil has been restricted from regular gametime during the course of the campaign and of late, he has found himself being unused despite making the substitutes' bench.